Australia’s Queensland state introduces a hard-hitting ad campaign to drive home the cost of traffic violence. Here in Southern California, most traffic deaths never even make the news. Maybe something like this could finally wake people up to the realization that the cost of the unhindered automotive hegemony on our streets is just too damn high. A driver gets lectured by a cyclist after failing to signal and observe the three-foot passing law — and turns out to be the chief of police for St. Paul MN, who took it surprisingly well. A Florida cop gets an earful when he mistakenly tries to tell a cyclist to get on the sidewalk. 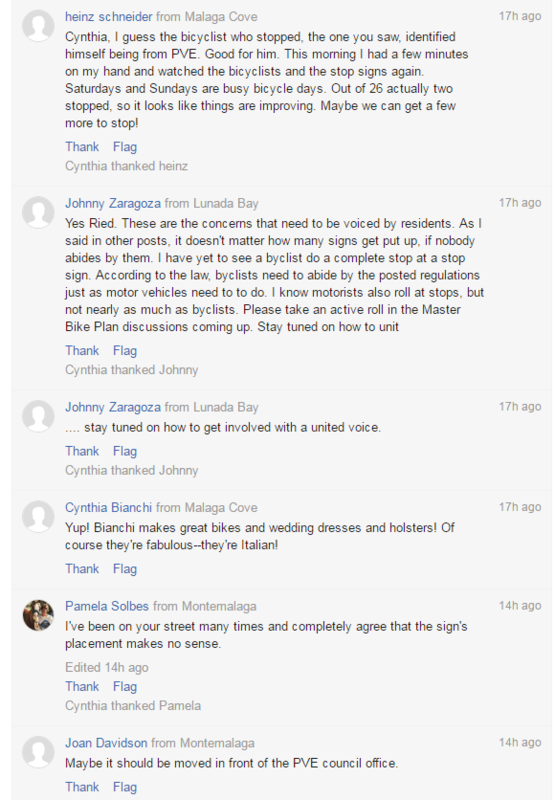 More kindhearted people in today’s bike news. An Oregon man scours the local landfill looking for bikes he can fix and give away to children; if he sees kids walking he’ll ask if they need a bike. Texas police dig into their own pockets to buy a special needs boy a new bicycle after his was stolen by a couple little kids. Missouri police donate an unclaimed bicycle to a woman who relied on her bike for transportation after it was stolen while she worked as an election volunteer. South Dakota state troopers pitch in to buy teenage boy a new bicycle after they stopped him walking along a freeway, and learned he had to walk eight miles to work every day. The men’s Olympic mountain bike race ended in a mirror finish of the London Olympics; the results left Peter Sagan feeling flat. Meanwhile, the youngest rider on the course won the women’s race. Mara Abbott writes movingly about coming so close to winning gold in the Rio road race. Chris Froome is off to a good start in the Vuelta a España following the team time trial. And any jerk can steal a bicycle; it takes a special kind of jerk to steal a painted cow from the 2012 London Olympic course that was going to be auctioned off for charity. Richard Risemberg calls for revolution, one council seat at a time. Shinola brings their Built-in-Detroit ethos to the Grove. Which it turns out is more of an assembled in Detroit ethos, but still. Santa Monica’s California Incline will reopen on September 1st with new bike lanes and walkways leading to and from PCH. Santa Monica will host this year’s Kidical Mass ride on September 17th. Temple City will install stop signs and other traffic measures to improve safety at the intersection of Rosemead Blvd and Sereno Drive, where a bike rider was hit by a car last year. An Orange County supervisor successfully lobbied for a bike and pedestrian path along a flood control channel to allow kids to get to school and a park more easily. The lawyer for a Fresno basketball coach who was sentenced to 12-years in prison for the drunk driving crash that took the life of a seven-year old bike rider, and critically injured his 18-month old sister, has filed a motion to withdraw his no-contest plea, arguing that a new video shows no one, drunk or sober, could have avoided the crash. Hikers, equestrians and environmental groups are joining in opposition to plans to open backcountry watershed trails in San Francisco’s East Bay to mountain bikes. The executive director of the Marin County Bicycle Coalition says there’s been an alarming increase in drivers deliberately targeting people on bicycles. 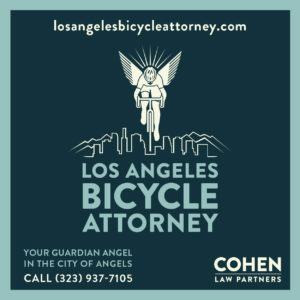 Anyone threatening a cyclist with a motor vehicle should automatically face a charge of assault with a deadly weapon, and do time upon conviction. There’s also been a jump in bike thefts in Marin County, with roughly 300 bicycles stolen so far this year. Advice on how to ride a bike with your dog. An Aussie couple are riding across the US with their autistic son, traveling over 3,000 miles from Washington to Washington. Hopefully, they won’t have to deal with a rampaging raccoon. Dallas wisely agrees to void a $259 fine for riding a bicycle without a helmet, which isn’t illegal for adults in Texas. A photographer catches a woman and her bike being washed off a Lake Michigan breakwater. A young Turkish woman is making what her doctors call a miraculous recovery after being the victim of a hit-and-run while riding her bike in Ohio early last month. Sometimes a bike is just a bike; this one is more than that to a local St. Louis community. Plans are gaining speed for a 60-mile bike and pedestrian trail connecting 24 towns along the Delaware River. Many people who ride across the country do it to raise awareness for a cause. A 50-year old Florida woman raised awareness for 50 causes, one for each of the 50 days of her journey. How to survive bicycling on Bolivia’s Death Road. Sing a song about bicycling with Shakira, and next thing you know, your own bike gets stolen. Good news, as the British sportscaster who nearly died from malaria after riding from the UK to Rio has awakened from her coma. An Edmonton, Canada blogger crunched the numbers to determine that riding in a separated shared path is safer than a painted bike lane. Meanwhile, the Edmonton cyclist who was the subject of racial slurs from a road raging driver and his passengers feels more hopeful after a meeting with the mayor. Caught on video too: Toronto police are investigating after a cab driver swerved into a delivery cyclist after allegedly arguing with the rider for two blocks. A Toronto writer says it’s okay to yield during your commute, and a little bit of empathy would benefit everyone. Which should be emblazoned on the inside of every windshield in LA. And on every handlebar. Inspired by the exploits of the British cycling team, a Welsh reporter takes a stab at track cycling. Leicester, England, home of the world’s most improbable soccer champs, responds to a cycling fatality by investing £2 million — the equivalent of $2.6 million — in a two-way cycle track along a major roadway. That’s exactly how Vision Zero is supposed to work; we may not be able to prevent all deaths, but we can take steps to keep them from happening again. Bike Radar issues ten very British, and very amusing, cycling problems. The rich get richer. Bike-friendly Barcelona commits to spending $36 million on new bike lanes. Which is about $36 million more than LA has committed to support the bike lanes called for in the new Mobility Plan. Good idea. Malta cyclists call on the government to make it illegal to obstruct bike racks. Pakistani police allegedly beat two young boys accused of bike theft. A Muslim Chinese man rode his bike over 5,000 miles to perform the Haj in Saudi Arabia. It’s not unusual to find things while you’re riding; a human skull, not so much. Or an English hyena, for that matter. The very definition of irony: A bicycle honoring the late great Muhammad Ali was stolen from the gym where he got his start in boxing after his bicycle was stolen. And let’s finish today by watching Coldplay ride BMX bikes around Mexico City. Charges have been filed in the death of cyclist Rod Bennett in Santa Clarita last week. According to the Santa Clarita Valley Signal, Lucas James Guidroz has been charged with gross vehicular manslaughter while intoxicated and hit-and-run resulting in death for fleeing the scene after running down Bennett from behind. It will be interesting to see what evidence prosecutors to support the DUI charge, since Guidroz waited two days to turn himself in — and then only after his car was discovered — giving him plenty of time to sober up first. Meanwhile, the Santa Clarita Gazette offers a nice profile of the popular music and math teacher who lost his life at age 53. And unlike the Signal, they get his name right. KPCC’s Air Talk program hosts a debate among the candidates for the 4th District LA County Supervisor to replace termed out Don Knabe, who’s held the seat for 26 years. Bike the Vote LA rates US Rep. Janice Hahn as the top choice for the position. The family of fallen Panorama City bicyclist Peter Loretta is looking for the kindhearted stranger who comforted the homeless man as he lay dying after being struck by a car last month. They’d like to thank him for his kindness. As should we all. Another Russian cyclist has tested positive for doping based on four-year old samples from the London Olympics. Meanwhile, Cycling Weekly asks the experts if doping can ever be eradicated from cycling. As long as there are benefits to cheating, people will find a way to do it. US pro cyclist Tejay van Garderen pulls his name from consideration from the Rio Olympics out of concern for the Zika virus with a pregnant wife at home. VeloNews offers a nice profile of American cyclist Evan Huffman, who’s back racing for a domestic Continental team after two less than satisfying years on the WorldTour with Astana. Two cyclists were bound by Taylor Phinney’s violent crash in the 2014 Nationals; one made it back to the top, the other hit bottom. Cycling Tips looks at how unknown rider Greg Daniels surprised the favorites to win the US national road championship. It could take until next month to fully reopen the LA River bike path. The Corps of Engineers should have most of the flood control barriers removed by the middle of this month, then LADOT could take up to another two weeks to ensure the path is safe to ride. And even then, some barriers could stay up until next year. UCLA’s Daily Bruin endorses candidates — and in some cases, withholds endorsement — for the Westwood Neighborhood Council. Including one candidate who believes bike lanes on Westwood Blvd should have been studied before being rejected. He’s got my vote already. The Eastsider takes a look at the co-ed Los Angeles Bike Polo team. Portland’s Elly Blue, Joe Biel and Joshua Ploeg return to Santa Monica for a vegan bike-focused night sponsored by Santa Monica Spoke. 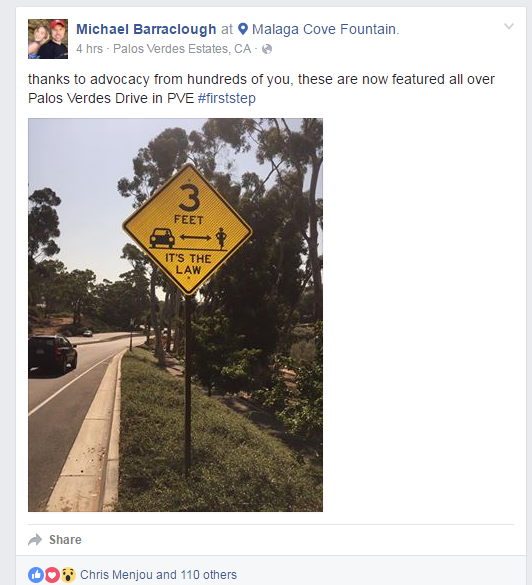 Cycling in the South Bay’s Seth Davidson reacts to having complaints of fallen cyclists and riders harassed by drivers ignored by the Traffic Safety Committee in Palos Verdes Estates. Long Beach police bust a thief who tried to use a shovel to break the lock on a bike near the beachfront bike path. Bike-friendly Long Beach Councilmember Suja Lowenthal prepares to step down after 10 years on the council. Meanwhile, the city ups their bike-friendly ante with 14 new recharge stations providing a fix-it stand and water fountain for cyclists. Streetsblog looks at three bike-related bills in the California legislature; one that would explicitly authorize riding side-by-side — which is now tacitly allowed, since it’s not addressed in state law — appears to be in trouble. Nearly 1,800 students in next year’s Stanford freshman class will get a new bike helmet, courtesy of a bike-riding Stanford parent and his wife. Sad news from Sacramento, as a bike rider was killed in a collision trying to make a right turn out of a driveway. Bicycling offers advice on where to position yourself on the road. Yet somehow recommends riding “a bit more into the lane,” rather than assertively taking the center of the lane as recommended by CyclingSavvy and the League of American Bicyclists. Streetsblog says one chart shows why helmets aren’t the answer to bike safety. Colorado’s governor vetoes an auto-centric bill that would have banned red light and speed cameras in the state, putting bike riders and pedestrians, as well as drivers, at risk. A Boulder CO woman says a cyclist just came out of nowhere to pound her car and punch her in the face. The fact that she thought he came out of nowhere probably explains why he was so mad. But violence is never the answer. Over 100 Texas kids get new bikes for having perfect school attendance over the past year. Sixty-seven University of Texas students will spend their summer bicycling 4,687 miles from Austin TX to Anchorage AK. A London track cyclist died after suffering a heart attack when three separate ambulances failed to respond because the velodrome wasn’t in their outdated satnav systems. London cyclists call on the city’s new mayor to live up to his promises to improve bike safety. Now that’s more like it. Great Britain considers on-the-spot fines up to £5,000 — the equivalent of $7,200 — for passing bicyclists too closely. Which compares rather favorably to the measly $35 fine for violating California’s three-foot passing law. The European Parliament issues a report on the state of bicycling on the continent. Uber has started a new service for Dutch bike riders, which provides bike rack-equipped cars for an additional charge. Caught on video: An Aussie truck driver repeatedly attempts to run a cyclist off the road, then exchanges curses with him at the next red light. If a driver tries to run me over, the last thing I’m going to do is wait next to him at a traffic light. A Thai drunk driver gets four years and a $59,000 fine for killing three bike riders and injuring four others when she plowed into a cycling club last year. Get your hot bike back with Bunz. The traditional battle over bike lanes versus parking goes on — but this time, the other side is armed. And if you’re going to assault an elderly driver for tailgating your bike, it’s probably best to get rid of the meth and syringes in your backpack before the police show up. Or better yet, just don’t. There are some sights virtually guaranteed to make any bike rider sad. 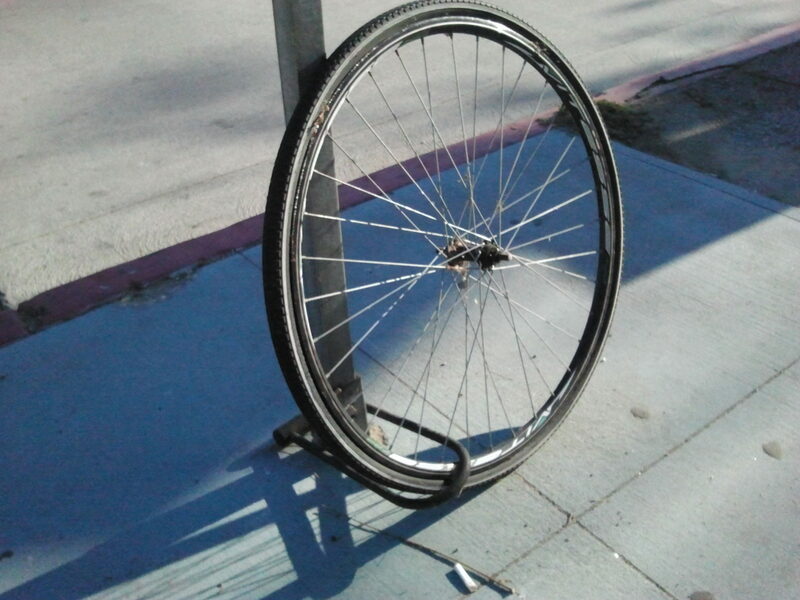 Like a lonely wheel still safely secured to a rack, when a thief has made off with the bicycle it was attached to. Which is a good reminder to always run your U-lock through the frame and back wheel, then around the rack. If the lock is long enough, you can remove your front wheel and secure it to the back one and frame, or run a cable lock through the wheels, in addition to a U-Lock or heavy duty chain through the frame. Always make sure the rack, or whatever object you’re locking it to, is securely fastened to the ground and solid enough to withstand bolt cutters or a saw blade. But even though parking meters fit that description, it’s illegal to lock a bike to one in Los Angeles, unless it has one of the newly approved bike rack attachments. Whenever possible, lock your bike in a well-traveled public place where it can be seen by people passing by; thieves usually prefer secluded spots where they can work undetected. And don’t forget to register your bike before anything bad happens to increase your chances of getting it back. After a Seattle special needs woman had her customized $10,000 bike stolen, the man who bought it for just $250 gave it back to her when he saw her story in the paper. And when the bike a Delaware man used to ride with his daughter and Downs Syndrome son was stolen, a stranger gave him a new one. Richard Risemberg says encountering a wild coyote while riding is nothing compared to dealing with the Greater American Road Hog. Think he’ll get the point? Highland Park residents set up a Día de los Muertos altar outside the office of CD1 Councilmember Gil Cedillo to remember the three people who have died on the street since he arbitrarily canceled a planned road diet. A pair of writers for the Orange County Register say we should forget expensive transit systems and focus our transportation systems on buses and expanding road capacity. Although they lose whatever credibility they might have had when they cite Gil Cedillo’s absurd critique that LA’s “elitist” bike plan would hurt his underprivileged constituents, even though most cyclists are working-class immigrants, especially in districts like his. Horrifying story from Colorado Springs CO, as three people are killed in a random shooting; the first victim was a man riding his bike who begged for his life before being shot. Wichita KS cyclists like the new downtown road diets and bike lanes; not surprisingly, drivers not so much. After an Illinois woman was injured in a shooting, she drove herself and two other victims to the hospital — and on the way, hit a hit a bike rider who works for the hospital she was driving to. Sounds like fun. Costumed bike riders take part in the 16th Annual Boston Halloween Bike Ride. Caught on video: A bike-riding Boston-area doctor is intentionally run down by a road raging driver who had honked and yelled at him to get out of the way. Tragedy in Maryland, as a couple riding a tandem were run down from behind by an accused drunk driver; their killer is charged with DUI and vehicular homicide. Nice thought, as a writer for VeloNews says cycling can be challenging or even painful, but being alive and able to ride a bike is never suffering. Seriously? After originally facing a charge of attempted murder for intentionally chasing and running down a bike rider, a UK motorist gets a whopping eight months for dangerous driving. That’s like convicting a robber of malicious mischief for shooting a bank guard. Britain’s largest bike retailer is now offering insurance for cyclists. So why can’t we see something like that here? Rather than taming dangerous drivers, an Irish police group wants to require bicyclists, walkers, runners and anyone else not safely ensconced in a couple tons of steel and glass to wear hi-viz after dark. A Welsh driver stopped and got out of his car to make sure he hadn’t killed a cyclist in a collision, then him lying there in the road; fortunately, the victim wasn’t badly injured. The director of an Israeli road safety group calls traffic deaths the other war that never ends. However, he also calls e-bikes a blight on the land after just one person is killed this year, compared to the seven that die every week from traffic collisions. An Aussie writer says thanks to a new one-meter passing law, riding to work isn’t as aggravating as expected, while another says stop the hysteria and give sidewalk riders a chance. Tie me kangaroo down, sport. Yet another Aussie rider was seriously injured in a collision with one. Inspiring story from Thailand, as an 11-year old boy with no arms is training to join a bike ride in honor of the king next month; he’s riding a customized bike that used to belong to the crown prince. The next time you’re bombing downhill, consider that your hydration system could have been part of the military industrial complex. You know you’re a cyclist when you’re buried in full racing kit 60 years after your riding career. And you have to be a pretty lousy bike thief to be convicted 26 times and banned from owning a bike, being in possession of a bike or advertising a bike or parts for sale. 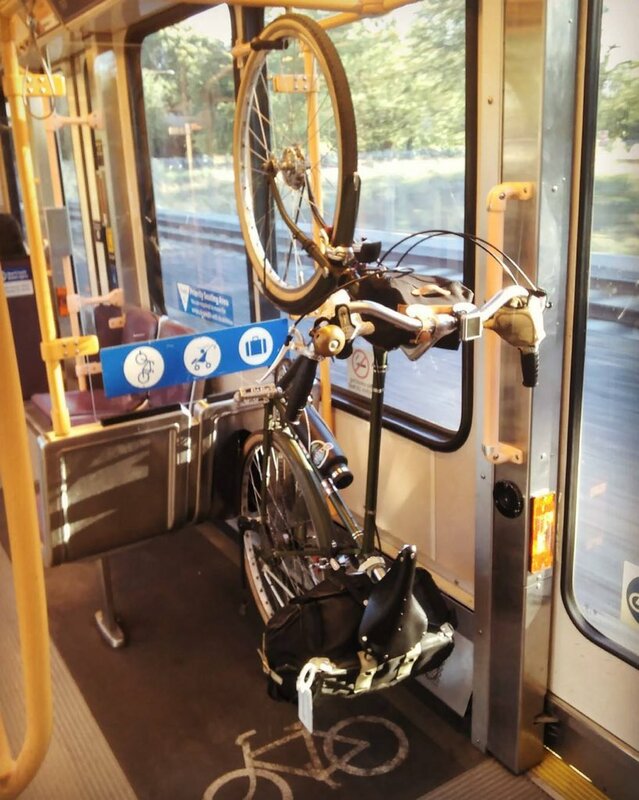 Keep a close eye on you bike when you use those racks on the front of a bus. That was the gist of an email I received Thursday evening, from someone who reported having his bike stolen while commuting home from work. Fortunately it was not my favorite cyclocross bike but rather a Specialized Rock Hopper that’s about 15 years old and that I was thinking about replacing. I ride buses a lot and I read the story of the fellow whose bike was stolen from rack while he was sitting in the back of the bus. So I sit in the front and I watch my bike at the stops. In retrospect I realized that I mainly watch when it is the only bike up there, for anyone who is going up to the front that shouldn’t be there. But this guy was a very clever thief who had a beater bike on the rack in front of mine. So even though I was watching my bike at the stop it didn’t occur to me that the guy in the front was undoing the bike catch to my bike and not his bike until it was too late. I can tell you that watching doesn’t do much good when all it takes a few seconds to take the bike off, mount it and take off riding. By the time I grabbed my backpack and my pannier and got past the people coming in the front door, it was too late. And what would I have done anyway, taken him down with a running tackle? My only option was to take the beater bike which he left. 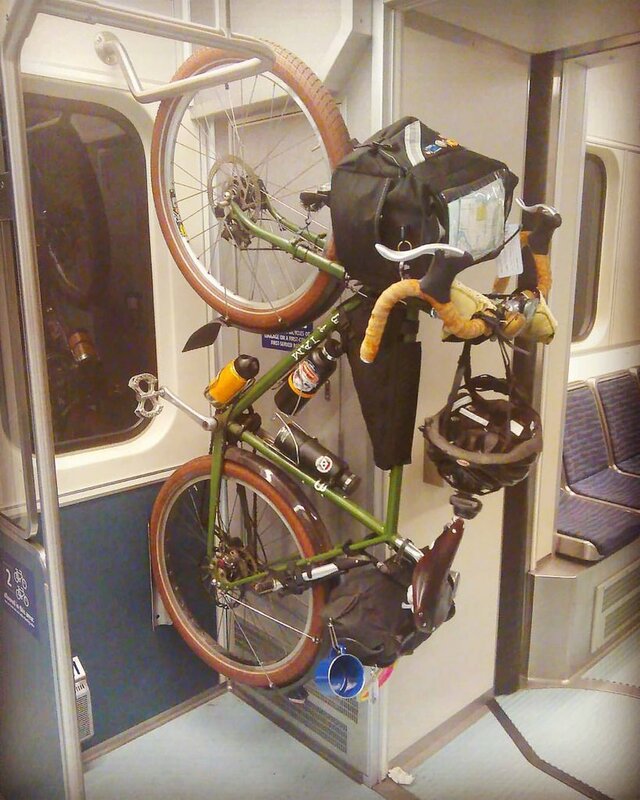 I have been paranoid in regards public transportation — I sit near my bike on the MetroLink even if that means sitting on the floor or standing and I lock my bike on Amtrak because there are only about six seats down in the bike area and they are reserved for disabled. But I can’t lock my bike to the Metro bike rack so instead I decided that I’m going to lock my rear wheel to the frame before I put it on the rack. So if someone decides to take it they aren’t going to be able to ride it away. Many bus drivers keep an eye on the bikes in front of them, but they can’t watch them all the time. And not every driver does. So anything you can do to disable your bike to keep a thief from being able to easily ride or roll off with it could be enough to protect your bike from being stolen. After all, it’s a lot harder to pick up a bike and run with it than it is to simply ride away. Today’s common theme: Motorists behaving badly. San Diego police are looking for a hit-and-run driver who rear-ended an experienced cyclist Thursday morning; she nearly lost a foot in the collision. A Chicago woman faces felony drunk driving charges after drinking all day and running into an eight-year old boy as he rode his bike; she also had an open container in the car. Unbelievable. Five Ohio cyclists were left crossed when the driver of pickup turned into them as they rode in a group; one rider died at the scene and two were airlifted to a hospital. A New Jersey driver faces up to 20 years in prison if he’s convicted of first degree vehicular homicide and other assorted charges in the drunken hit-and-run death of a bike rider. To make matters worse, he 1) told police he thought he hit a deer, 2) told police he wasn’t the driver of the car, 3) refused to give a urine sample without a warrant, and 4) had been driving on a suspended license since 2007. A South Carolina driver faces charges for driving with a suspended license and operating an uninsured motor vehicle. But the cyclist he killed? No big deal. A road-raging English driver is charged with intentionally chasing down and ramming a bicyclist, all because the cyclist touched the man’s car to steady himself at a red light. The driver claimed the victim had swerved into his car, which was disproven by security cam footage. A Helsinki driver faces up to eight years for deliberately running down and killing a cyclist in a road rage incident. And how distracted does a driver have to be to miss — or rather, not miss — a camel walking on the side of a road in Southern California? Then again, it’s not just motorists; Scotland police are looking for a cyclist who whacked a schoolboy in the head with his bike lock. Thankfully, we can counter that with a few stories of people at their best. Minutes after big-hearted Kansas City police take a report of a stolen kids’ bike, they come back with a new one to replace it. The owners of a Michigan Pizza Parlor gave a new bike to an autistic employee after his was stolen while he was at a movie to celebrate his first paycheck. A NASA engineer in Huntsville AL fixes bikes for neighborhood kids and gives away refurbished ones, along with life lessons for the young riders. 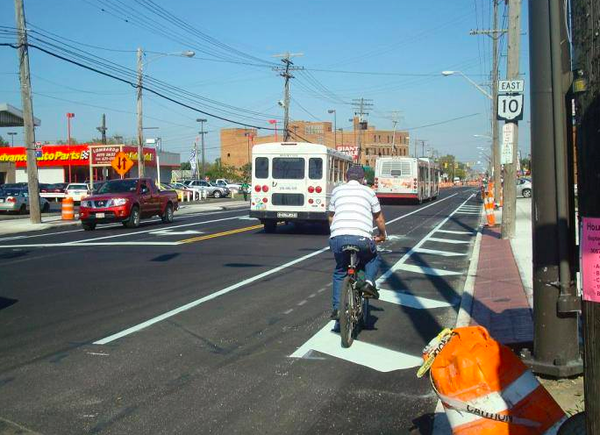 For reasons known only to them, Cleveland is redefining buffered bike lanes, apparently choosing to protect cyclists from riding too close to the curb while moving them next to the far more dangerous traffic to the left. A couple quick notes from this week’s Interbike in Las Vegas. Credit Jay Wolff of the Santa Monica Helen’s Cycles with bringing the stars of Breaking Away back together. In light of the Interbike sockgate scandal, Bike Radar lists five of the bike industry’s most sexist marketing fails. Of course, these are just from the last few years; bike marketing has been a boy’s club for decades. And they wonder why more women don’t ride. And what could be a more natural product extension for a multi-sport clothing maker to roll out than a new reposado tequila? Mad Men producer Tom Smuts will once again be riding his bike to the Emmys this Sunday, along with actors Aaron Eckhart and Jon Huertas, and producers Alex Cary and James Younger. City officials including councilmember Tom Bonin will tag along. Streetsblog offers an update on Metro’s planned bikeshare system, which remains on track for a sponsorless mid-2016 opening. A writer for USC’s Daily Trojan badly misunderstands and misrepresents LA’s new mobility plan; the plan is actually designed to reduce congestion by providing alternatives to driving. Evidently, she’s learned the wrong lesson from modern American politics, that facts don’t matter as long as they’re labeled opinion. The LA Weekly’s Hillel Aron tries to ride the full length of the LA River. Even in two parts — the ride, not the story — it’s not as easy as it sounds. Santa Monica is nearing completion of the new Colorado Esplanade connecting the terminus of the Expo Line with the Santa Monica Pier, including a two-way separated bike path. The 29th annual Nautica Malibu Triathlon rolls, runs and splashes through the city this weekend. 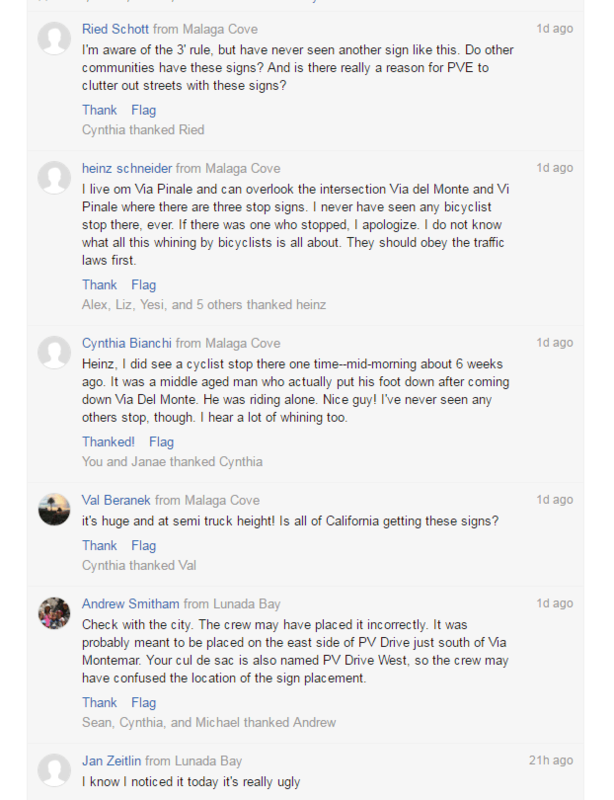 The OC Register astutely observes that even adults need to know how to ride a bike. San Diego strawberries may end up costing a little more, but residents will be rewarded with a new rail bike and ride. A San Luis Obispo man gives a whole new meaning to the term custom bike maker. San Francisco posts banners to encourage drivers to slow down. Might as well, since nothing else seems to work. New census data shows that bike commuting continues to grow in the US. The findings are even more impressive since census data undercounts transportation cycling by failing to including multi-modal or non-work related trips. Tern and Xtracycle team up for a cargo foldie; a Kickstarter to fund it is just over halfway to the $60,000 goal with 29 days to go. El Paso is the latest city to get bikeshare before Los Angeles. Thousands of bike riders tear through the Motor City with Slow Roll Detroit at breakneck speeds up to 10 mph. No bias here. A Connecticut newspaper says a 10-year old girl was critically injured when she hit a car while riding her bike, then later explains that the car actually struck her. New York’s mayor is taking credit for a 13% drop in traffic deaths in his first year in office. Even though the bike lanes, road diets and other changes to the streets that most likely led to it were done under the previous administration. Now there’s a new excuse. Bike-friendly improvements to a New York street have been put off until the UN adjourns and the pope puts the city in his rear view mirror. Police in New York’s Upper West Side credit a 40% decrease in injuries to a 160% increase in cyclist traffic tickets. Yes, longer bike shorts really are more aero. And no, you’re probably not fast enough for it to make a difference. A Swedish couple bicycling around the world was hit by a car in Brazil. The driver, who was going 12 mph over the speed limit, will face a manslaughter charge after the woman rider didn’t make it. Vancouver police realize they had already impounded the bike that had been stolen from a Taiwanese cyclist on an around-the-world ride after a reporter called to ask about it. An 18-year old London man was convicted of stabbing a 15-year old boy to death in an utterly senseless attack to steal his bicycle. Nice. Employees can ride their bike directly into a new London office building and down a ramp to the basement, where they’ll find bike parking, changing rooms and lockers. Dubai has made a big push to become bike friendly with a network of bicycle paths, cycle tracks and bike lanes across the emirate. Aussie cyclists may finally be able to legally stand on their pedals. Bangkok, Thailand goes car-free this Sunday, though the city still has a long way to go to make bicycling an everyday choice for people. Caught on video: Wherever you’ve ridden, it probably doesn’t compare to a 59-foot slack line over a 367-foot gorge. If you’re going to steal $120 worth of coffee from a donut shop, don’t go back there a few days later riding the same distinctive bike, and leave the heroin and drug paraphernalia at home while you’re at it. And drivers already act like you’re wearing a cloak of invisibility on your bike. So why not do it for real? As promised — or maybe threatened — the ironically named Fix the City has filed suit against the City of Los Angeles to keep it from doing exactly that. The NIMBY non-profit is fighting the newly adopted Mobility Plan, which was created to improve safety and traffic flow by providing Angelenos with alternatives to using their cars. Yet the group’s actions promise to keep the city’s streets just as dangerous and congested as they are now; apparently, making the city more bikeable, walkable and livable city isn’t their idea of fixing it if drivers can’t continue to careen carelessly through LA’s already congested streets. According to the LA Times, the suit alleges the plan will increase tailpipe emissions as drivers spend more time idling in traffic due to reduced road capacity, a supposition based on the outdated worst-case projections contained in the plan. And which the plan clearly identifies as such, despite the repeated failure of the press to press the group on their repeated misrepresentation of those projections. The assumptions contained within the Mobility Plan make it clear that the predicted doubling of congested intersections will only occur if no one switches to alternative forms of transportation. Yet it also predicts that once the plan is built out in 2035, we’ll see a 170% increase in bicycling, a 38% increase in walking and a 56% boost in transit use, with a corresponding decrease in motor vehicles on the road. Again, those are very conservative estimates; more likely, those numbers will be significantly higher as safer streets, more trains serving more areas, and faster bus routes induce more people to leave their cars at home. The group also claims that safety will be sacrificed as emergency responders find themselves stuck in traffic. Even though the city’s commitment to Vision Zero, which is contained within the plan, means they should have significantly fewer emergencies to respond to. It’s ironic that a spokeswoman for the group says that if this plan were put to a vote, the people of LA would toss it out in a New York second. Particularly since New York has already begun a similar transformation of their streets, and the sky has yet to fall. In fact, an overwhelming majority of New Yorkers approve of the changes to the city’s streets, even though some groups had fought them tooth-and-nail, just as Fix the City is trying to do. The best way to look at this suit is as the last desperate gasp of LA’s auto-centric past, pursued by people unable to envision a future in which cars no longer hold hegemony over the earth. Hopefully, the courts will see it for what it is, and toss it in the dustbin of history along with the car culture that has so damaged so much of our city. And give LA back to the people who live here, and not the cars they drive. Sad news from Santa Monica, as a homeless man was found dead, apparently from natural causes, after riding his bike off the bike path and into the sand, before collapsing near Shutters on the Beach. LADOT General Manger Seleta Reynolds and Leah Shahum of the Vision Zero Network will discuss what Vision Zero means for Los Angeles from 7 pm to 8:30 pm on September 24th in the City Council chambers at LA City Hall. Still more news about kindhearted people this week, as a stranger donates a new bike to a Dallas girl, after her mother had put up a handwritten poster shaming the thief who stole hers. And an Indiana woman saves the life of a young boy who got snagged on a moving train after he tried to go under it with his bike while the train was stopped. Dutch cyclist Tom Dumoulin stormed through Wednesday’s time trial to move into the lead in the Vuelta, while American rider Larry Warbasse feels pretty f—ed entering the race’s final week. A 28-year old Brooklyn preschool teacher could be the first African American woman to go pro, after just two years of racing. Don’t hold your breath for that long-promised continuous bikeway along the newly extended Expo Line. BAC member Jonathon Weiss points the finger at understaffed city departments and old-fashioned CYA for delaying it, along with equally long-promised wayfinding signage and a Westwood Greenway on the Expo corridor. Streetsblog puts last weekend’s opening of the East Side Riders Bike Club’s new bike co-op into perspective, as bicycling continues to flourish in long neglected parts of the city. The Hollywood Reporter talks with Stephen Frears prior to the premier of his Lance Armstrong film The Program, which premiers in Toronto later this month. The Daily News looks at the return of CicLAvia to the San Fernando Valley, as we mentioned earlier this week. 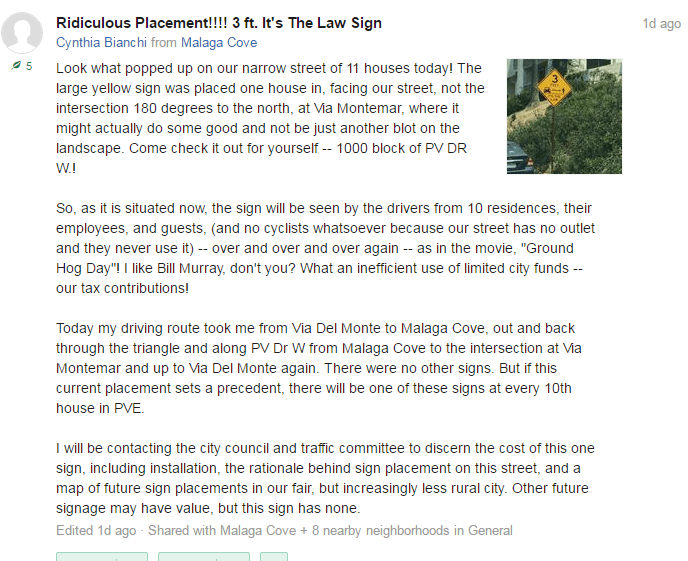 Apparently CiclaValley likes the idea, though he may be surprised to learn he’s now a community organization. Bike Walk Glendale offers a free bike-safety and skills workshop for kids this Saturday. 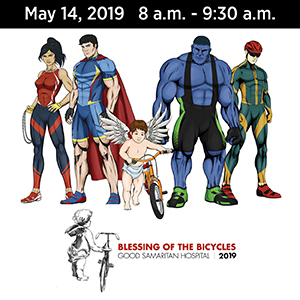 Northeast Los Angeles will host a Kidical Mass on the 19th, as part of a worldwide Kidical MASSive celebration of kids and bikes. When I was a kid, I was happy to ride my bike around the neighborhood. Three brothers ranging from just nine to eleven years old will ride 100 miles from Irvine to San Diego in Saturday’s Amtrak Century, sponsored by the Orange County Wheelmen. Note to the OC Register: It’s a ride, not a race. A San Diego cyclist was seriously injured Tuesday night when he apparently made a left turn in front of an oncoming car near Balboa Park. Maybe Fix the City could change their name to Fix the State, and sue to undo the successful makeover of an Encinitas street. 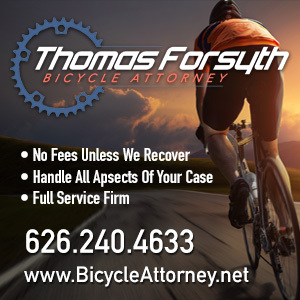 A Thousand Oaks bike rider was injured when he was broadsided by a truck after reportedly running a red light. Police say alcohol played a part, but this time, it wasn’t the driver who was drunk. As the story points out, bicycling under the influence is a misdemeanor in California, with a fine up to $250. A San Jose cyclist is suing city police for allegedly holding him at gunpoint and beating him senseless for no apparent reason after they stopped him for riding without a headlight. Something tells me there may be another side to this story. The road-raging Marin County cyclist who beat up a driver after allegedly being clipped by his mirror gets off easy, with a sentence of just 90 days in county lockup along with another 90 days of possible home detention. The popular Fly6 rear-facing bike cam and taillight combo is about to be joined by the Fly12 headlight and bike cam; at $349 it’s priced in the midrange of bike cameras that come sans lights. Bikeshare is coming to Portland after a four year delay. Meanwhile, Baltimore cyclists hope the third time is the charm, as the city takes it’s third stab at a bikeshare system. Police say a well-known Minnesota cyclist was doing nothing wrong when he was killed by a little old lady from Pasadena who veered onto the shoulder of the roadway. There’s a special place in hell for someone who would steal a three-wheeled bike from a 16-year old Minnesota kid with hydrocephalus and epilepsy; he only got to ride the bike twice before it was stolen. Update: police recovered the bike on Wednesday. Unfortunately, the jerk who stole it is still out there. Completing our Minnesota triptych is a nice story of a successful bike shop born of a man’s attempt to keep busy while recovering from an addiction to painkillers. A Michigan man faces up to 15 years for the hit-and-run death of a nurse who was participating in a group ride across the state. An Ohio driver was over the legal alcohol limit when he killed a cyclist three years ago; then again, so was his victim. Here’s your chance to hear that anti-bike Boston columnist explain in his own words why bikes don’t belong on the city’s streets. Someone has been booby trapping a Maryland trail with spike boards and fishing line strung across the trail since 2013; this week a mountain biker found razor blades sticking out of boards buried in the trail. Acts like this should be considered domestic terrorism cases, since it’s a deliberate attempt to cause harm and incite fear in order to run cyclists off the trail. The Department of DIY strikes in Boston, as a cyclist used planters and orange cones to convert a buffered bike lane into a long-promised protected bike lane. A Virginia driver wasn’t wearing his much-needed glasses when he rammed a cyclist from behind; he was already scheduled for arraignment on a previous hit-and-run next month. 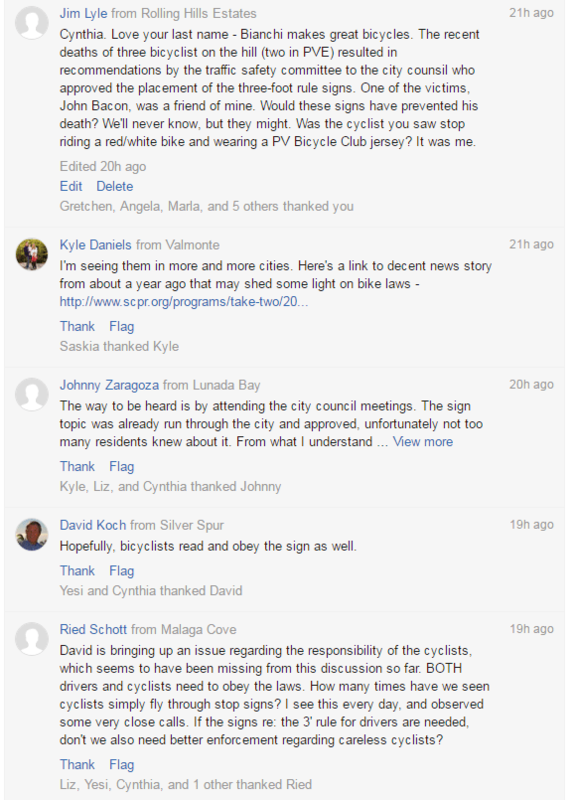 A Florida weekly says the state is a cyclist’s worst nightmare. Buses and bikes could save billions worldwide. An Oregon man spent eight years traversing the world on a solo tandem ride; he met his wife when she hopped on the back in Argentina and never got off. A British woman is charged with deliberately driving up on the sidewalk to ram a bike rider, apparently because she objected to a sign asking drivers to slow down. But bikes are the problem, right? An Irish cyclist leaves a large dent in the back of a car when he slammed into it after the car stopped in front of him. Apparently, the driver wasn’t too concerned; then again, he didn’t get out to see the dent. Four Philippine scouts plan to ride over 600 miles to distribute flashlights and promote disaster awareness. Caught on video: A cyclist takes a vertigo-inducing ride straight down the face of a 200-foot dam, complete with splashdown at the end. A Czech woman performs a beautiful bike ballet on a brakeless fixie. And a Portland woman makes the unlikely journey from bike mechanic to Jewish songstress. 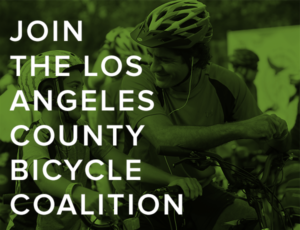 I hope you’ll join me in thanking Mike Wilkinson, Christopher Meszler, Erik Griswold, Lois Rubin, and David Aretsky for the kindness and generosity they’ve shown in donating to support BikinginLA. It’s people like them who help make this site possible.